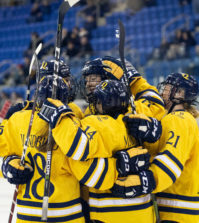 The Quinnipiac women’s ice hockey team was selected third in the ECAC coaches’ preseason poll on Thursday. The third place ranking marks the highest preseason ranking the Bobcats have had in program history. 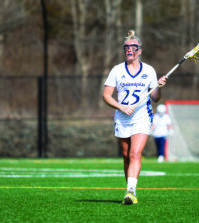 The Bobcats finished with one first place vote, while top-ranked Cornell took the rest. Harvard was ranked second, while Dartmouth was ranked fourth. 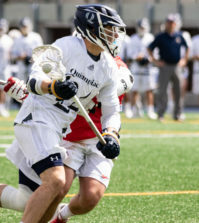 Seeley, entering his fourth season as the Bobcats’ head coach, has improved his team’s record each year and is coming off the best season in program history—which they finished 22-12-3 and fifth overall before losing to top-seeded Cornell in the ECAC semifinals. The preseason all-conference team was also announced Thursday and sophomore forward Kelly Babstock and junior goaltender Victoria Vigilanti were named to the team. 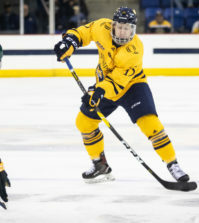 Babstock shattered the Quinnipiac record books, recording 58 points on 30 goals and 28 assists and was the ECAC Rookie and Player of the Year. Vigilanti, who was the 2009-10 ECAC Rookie and Goalie of the Year, recorded 847 saves and had a .932 save percentage. The Bobcats open their season at Mercyhurst on Sept. 30 at 7 p.m.